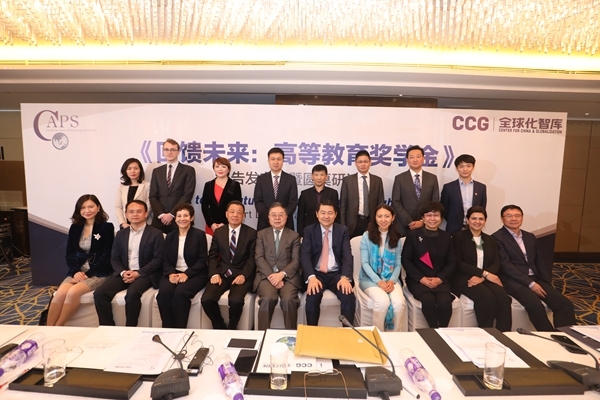 Presented by the Center for Asian Philanthropy and Society (CAPS) and the Center for China and Globalization (CCG), the report launch and roundtable discussion featuring "Giving Back to the Future: Scholarships for Higher Education" was held in Beijing on April 13, 2019. The CAPS' report stands out as the very first piece of research done on the impact of scholarships for higher education in Asia, with a special focus on the status quo as well as the possible trend of philanthropy scholarship. Through statistical analysis of massive data as well as drawing on specific case studies, the report evaluated the contribution that scholarships have made to the student, the community and the country, suggesting possible pathways to maximize the benefit of social investment in Asia. Experiences of scholarship winners from China, India and Philippines and stories of renowned philanthropists in Asia were also included in the report. Ms. Mehvesh Mumtaz Ahmed, director of research at CPAS, explained the significance of philanthropy scholarship during the roundtable discussion, saying that, according to the report, every set of scholarships is capable of improving the lives of 26 people. The scholarship obtained by each student can translate to not only the enhanced individual ability to bring a better future for a family, but also the willingness to volunteer and to give back to society through civic engagement. "In addition, the report also provides a tool kit to help Asian philanthropists improve the efficiency of educational investment and the influence of scholarships projects," added Dr. Ruth A. Shapiro, founder and chief executive of CPAS. Several renowned Chinese philanthropists in the discussion also presented a glimpse of the development of philanthropy scholarship in China. Mr. Ronnie C. Chan, chairman of Hang Lung Properties and CCG co-chair, pointed out the traditional standing of philanthropy scholarship in China. "Nine out of ten of the wealthiest billionaires have dedicated and contributed to scholarship programs," he mentioned. Other philanthropists on the roundtable also shared their practices in furthering philanthropy scholarship with Chinese characteristics. Li Yinuo, chief representative of Beijing for The Bill & Melinda Gates Foundation, focused on primary school education, while Wang Guangfa, chairman of Beijing for Fazheng Group and president of the Beijing Royal School, spoke about the training of Chinese personnel in the fields of pharmacy, pharmaceutics and pharmacology in Ivy League schools. Michael Kuan, founder and CEO of Kuan Capital, on the other hand said he believes that scholarships for students at prestigious universities could sometimes be the icing on the cake. "We prefer to help students at comparatively less elite universities or students with special majors." Kuan also suggested developing a form of philanthropist scholarship with Chinese characteristics instead of copying the American model. After the roundtable discussion, several entrepreneurs and experts were also honored with philanthropy awards in recognition of their devotion and dedication in this field. CAPS releases the very first study on Asian philanthropy scholarship with CCG in Beijing on April 13, 2019.